But how wise are you? Admit it, you know nothing and in knowing this, you know you are wiser than anyone who thinks they know everything. This is the starting point for the Socratic method, do not start with a lofty appreciation of your own knowledge but with an appreciation of your own ignorance. It is through the admittance of ignorance that you can then begin to seek out how best to live. Know thyself! Rather than worrying about convention or worrying about what others might think, you have to find it in your own soul how to live the good life. For Socrates this is a moral and rational process that involves hard questions. These hard questions are a constant intellectual process through which we might uncover the truth and reality about our lives as lived. Make no mistake, this method is looking for truth. 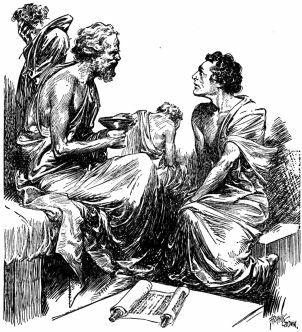 Socrates used dialectic as a teaching method: ask questions, get answers, then question the answers. There weren’t easy answers to his questions, no wonder he pissed people off, as soon as something was settled up pops Socrates to undermine the consensus. Socrates saw himself as a kind of intellectual midwife bringing truths to birth; does this method do that? Socratic method is a form of argument called elenchus – refutation and cross examination; it is great fun for those involved if all are happy to participate, it is however quite threatening to those who are not, they can see it as upsetting and quite aggressive. What the questioner tries to do is look for contradictions and inconsistencies in answers and by the time the session is finished most often participants find themselves in a state of Aporia or doubt about quite fundamental things. This is the heart of the Socratic dialectical form of questioning, with many people often ending up none the wiser. It has no doctrines to pull out of the bag, you don’t want to use it in a discussion where you want students to respond in one way. It would be dishonest to use it in a citizenship class to discuss in race or gender if you are wanting a certain outcome. Therefore use carefully in the classroom! Don’t open pupils minds to all sorts of thoughts only to castigate them for those thoughts. In fact it’s not a good method for lots of teaching, if you want children to know that 9 x 11 = 99 you might not want to question their answer if they get it right because the answer is ‘true’. It is a good way to get students to realise the enormity of their own ignorance, and also yours! Therefore in order to pull it off the relationship between a pupil and teacher is important as well as the relationship between the pupils in the rooms: can the pupils take the rigorous questioning that is bound to come their way? Are they robust enough at a tender age to realise it is not them being questioned but our assumptions and that some unpalatable truths might be exposed on the way? Where it works really well is examining a core belief in your subject that is open to doubt. In Art this might be the perennial question ‘What is Art?’ For me, as a teacher of theatre, I would return regularly to the question ‘What is truth’? It was a question that allowed us to look at the different theories of many theatre practitioners: Stanislavski, Brecht and Artaud… We questioned ‘truth’ through realism and naturalism, surrealism, expressionism, dialectical materialism etc. Therefore, instead of questioning the ‘facts’ I wanted students to know, we had the purpose of bringing our knowledge of different theories to our Socratic dialogue. The students had to know lots of stuff to enrich the argument; my aim was always to disrupt the central question but not to disrupt the knowledge that was brought to bear in the argument, this I would always check for accuracy. Eventually students would try to persuade people as to the efficacy of certain ideas more than others, I would expose that to questioning, we’d come up with a new understanding, expose that to questioning and so on, in other words the process of the trivium, through grammar to dialectic to rhetoric and round again. At the end of the theatre course students had explored fully the question of what is truth in theatre, and would be able to express their own strong opinions as to what it was to them; this helped each of them to know thyself as a maker of theatre.